At RFU, we've developed an interprofessional, hands-on approach to academics that gives you the tools you need to stand out in your field, even as those fields continue to change. As home to the DeWitt C. Baldwin Institute for Interprofessional Education, and the Interprofessional Community Clinic, you'll discover that we consistently find ways to bring together all parts of the healthcare team; in fact, through healthcare simulation, you'll quickly learn the importance of partnering with patients. Our dedication to diversity brings many points of view to how we approach academics. We know that when we understand our world, we gain a better understanding of our communities, so our Global Health initiative supports the type of learning that can only happen far from campus. And when you're on campus, we've created a place that can meet the needs of every student, in every program. Not sure where to start? We've created a free health sciences career guide that can help you realize your path. 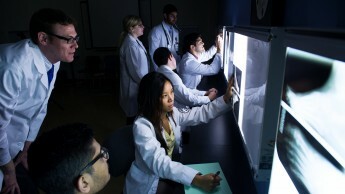 RFU is a graduate level health professions and sciences university made up of five schools. Each school offers specific degrees and training, while all working together interprofessionally to improve patient care and well-being. Interprofessionalism is a word with many syllables but a single goal: better healthcare for everyone, with strong interdisciplinary teams as the foundation. Improved patient outcomes—especially as healthcare delivery and insurance systems continue to change—drive our commitment to Interprofessional teaching, learning, and clinical care, and have established RFU as a national leader in this approach. If achieving work/life balance is as important to you as your career is, online learning is an exceptional way to reach your goals. At RFU, healthcare professionals and scientists from dozens of different fields come together to learn from each other and mold the future of medicine and science. Find your passion at Rosalind Franklin.